Located in a rural setting, we are surrounded by beautiful foothills and a spectacular landscape. Knot II Bragg Farm's history can be traced back to 1891, when P.S. Hardiswon and local lumberman cleared the lands. Geographically unique, Knot II Bragg Farm, which sits on an underground lake, is rich in history and natural resources. Icy waters from this natural reservoir "boil" up and feed the deep waters of Copper Penny Pond. Divided by the west branch of Salmon Brook, the farm boasts one of the finest cedar swamps in Northern Maine. In addition, the back side of the farm, along the west branch of Salmon Brook, was once used by Native Americans as an encampment where they dried salmon for winter use. Once you enter Washburn, you will need to look for the town library. Coming from Presque Isle, the library will be on the left.. At the library, turn left onto Bridge Street. Cross over a small bridge. On the right, you will see a Methodist Church. At this church you need to turn left onto Church Street. The turn is a bit odd, so don't let it surprise you. 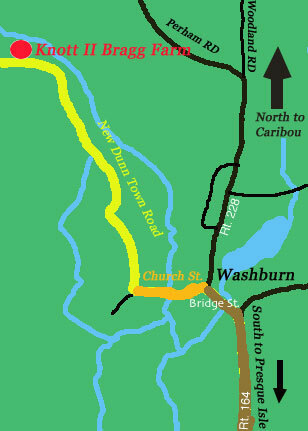 Church Street dead ends on New Dunn Town Road. Turn right here. The farm is approximately 3 miles from town on the right. There is a sign by the drive way indicating that you have arrived at Knot II Bragg Farm. We look forward to meeting you.